A STRANGER IN THE HOUSE. By Shari Lapena. Penguin Audio. Read by Tavia Gilbert. 9 hours; 7 CDs. $47. If Shari Lapena’s first suspense novel, The Couple Next Door, was as good as most people seemed to think it was, then she’s suffering from sophomore slump with A Stranger in the House. I didn’t read the first one, so I can’t compare. Lapena’s second suspense offering is a good example of an audio book that I listened to and enjoyed, but I probably would not have finished if I’d been reading the printed novel. The story was entertaining enough while I was driving and listening, but not sufficiently well written to make turning pages worth the effort. One problem with A Stranger in the House is a characteristic that some readers don’t seem to mind. Although I like a well-told suspense story, the suspense itself is not enough to fully engage me. I want at least one character I like enough to care about. In this book, I don’t much like anybody. As the story begins, Tom Krupp, a successful young professional in an upstate New York town, comes home to his nice house in the suburbs to discover that his wife, Karen, is gone. She left the house in such a hurry, apparently, that she didn’t even take her cell phone or her purse. None of this is like Karen, a usually careful person. While Tom is still phoning friends, trying to figure out where she’s gone and why, he gets word that she’s been hurt in a car accident in the bad part of town where she’d never go. By all accounts, she was driving erratically and much too fast before she crashed into a pole. As things rapidly progress, it turns out a man also was shot to death in an abandoned restaurant in the same part of town, at about the time Karen was driving wildly. Police detectives, suspicious about the coincidence, begin delving into Karen’s mysterious past. Meanwhile, Karen’s only friend, her neighbor Brigid, is extremely interested in all that’s happening. None of these people are appealing or sympathetic. Karen and Tom both have their secrets. Rather than feeling sorry for Karen, the reader begins to mistrust her and see her as manipulative and sneaky. Tom has no backbone and seems mostly concerned about himself. Brigid, stuck in a dull marriage, is a caricature of the scheming woman as she knits by her window, watching her neighbors and lusting after Tom. If the characters in a suspense novel aren’t appealing, then the suspense needs to be original, gripping and surprising. Unfortunately, A Stranger in the House is all too clichéd and predictable, starting with Karen’s convenient amnesia. Much of the plot is simply hard to believe, such as Tom having married Karen and been with her a couple of years without knowing anything about her background. Lapena offers what are supposed to be plot twists, but they are fairly easy to see coming. As an audiobook, this one was entertaining enough to pass the time, even if I frequently wanted to shake – or worse – the main characters. But here’s hoping Lapena can give us a better plot and at least one likable character next time out. 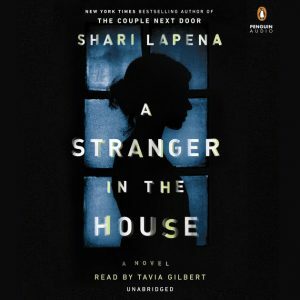 This entry was posted in Audio Books, Mysteries, Thriller/Suspense and tagged A Stranger in the House, audiobooks, Shari Lapena, suspense. Bookmark the permalink.